Shop our signed Wales Rugby Memorabilia including signed Wales Rugby shirts, balls and photographic displays. 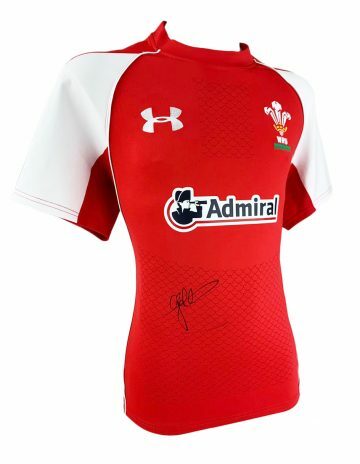 All of our Welsh rugby autographs come with free UK delivery, fast worldwide shipping and Certificate of authenticity. Most have photo proof! Six Nations stalwarts Wales are well known worldwide as one of the founding nations of rugby. The Welsh love affair with rugby began in the mid 1800s, when it was introduced by Reverend Roland Williams at St David’s College. By the 1890s the Welsh developed the three quarters formation – which completely revolutionised the sport and was eventually adopted universally. Wales has a long history of game-changing breakthroughs and record wins. They’re currently listed third in the Men’s World Rugby Rankings, having won the championship a whopping 26 times, sharing the title 9 times. They’ve also clinched 11 Grand Slams, securing their greatest win against Japan (98-0) in November 2004. Whilst they’ve appeared in the Rugby World Cup 8 times, Wales have yet to clinch a win, and their third place result in 1987 remains their highest result in the competition to date. Buy signed Wales rugby memorabilia at Firma Stella today. Here you’ll find autographed Wales boots, balls and shirts signed by some of the nation’s most iconic players and teams. A true celebration of the history and prominence of rugby in Wales, our collection includes a variety of unique and exclusive items sourced directly and carefully picked. 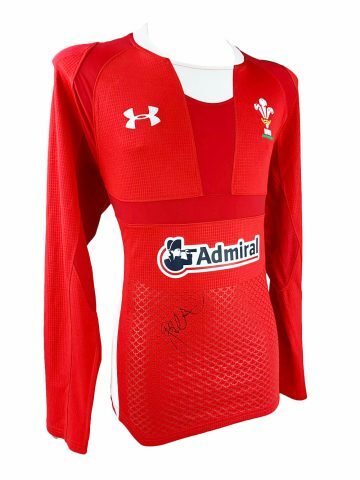 Every signed Welsh rugby item is supplied with a certificate of authenticity so that you can be sure of its provenance and value.